Fascinating document illustrating Bruce's rediscovery of the source of the Blue Nile. To My Worthy and Learned Friend the Honourable Daines Barrington This Plan of two Attempts to Arrive at the Source of the Nile is dedicated by his most Obliged and faithful Humble Servant James Bruce. This is a fascinating, significant, beautifully engraved, intricately detailed 1790 map of ethiopia (Abyssinia) and the source of the Blue Nile by the Scottish adventurer James Bruce. 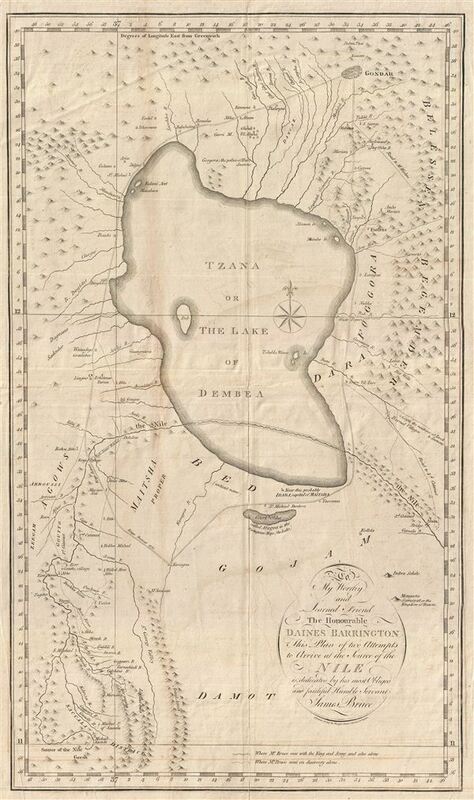 Centered on Lake Tana (Tzana), this map covers from the ethiopian capital at Gondar south as far as the Saccala District and the Geesh Abay (Geesh Springs). The map plots Bruce's travels in search of the source of the Blue Nile starting from the ethiopian capital of Gondar. Local guides led Bruce southwards around Lake Tana (Tzana) and eventually down the Abay River to Gish Abay, the source of the Blue Nile. Bruce claimed to have discovered the Gish Abay springs, but in a fact that he was well aware of, was merely retracing the steps of the Jesuit missionaries Pedro Paez and Jeronimo Lobo. Bruce then traveled northwards, following the Blue Nile to its confluence with the White Nile in Nubia, before following an overland caravan route to Syene and thence back into egypt and europe. Bruce's exploits were ridiculed in his day, but much of the information he collected worked its way into the cartographic corpus, appearing in later maps of the region by Cary, Thomson, Pinkerton, and others. Cartographically this map makes a number of advances and well as promotes a number of misconceptions associated with Bruce's theories. The course of the Blue Nile as well as much of the Abyssinian interior is meticulously mapped and, by and large, accurate. Very good condition. Original pressmark visible. Blank on verso. Some margin repairs. Some wear and verso reinforcement along original fold lines.